The Devlin lab at Harvard Medical School uses strategies from chemical biology to study the human microbiome. Our goal is to control the chemistry of human-associated bacteria in order to understand how the microbiome affects human health and disease. The lab leverages expertise from different fields, including synthetic organic chemistry, molecular biology, microbiology, analytical chemistry, and bioinformatics. We currently have positions for post-docs, graduate students, and undergraduates. In particular, we are actively seeking (1) potential students with an organic chemistry background interested in using chemistry to study biological problems and (2) microbiologists / biochemists interested in studying the human microbiome. If you are interested, get in touch. 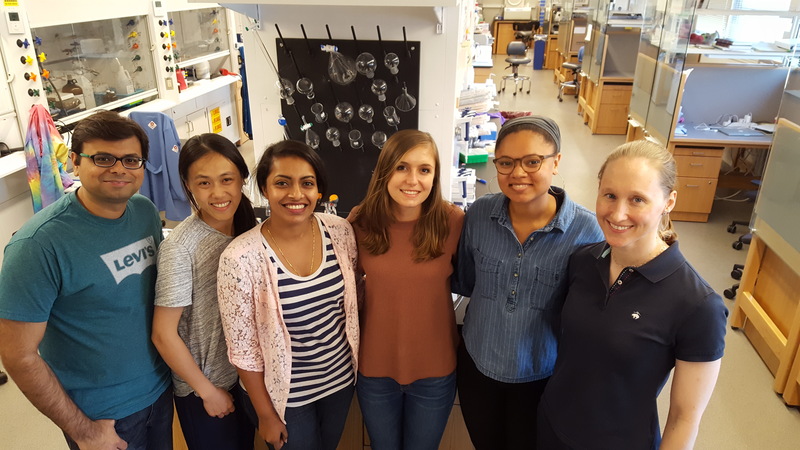 March 2019: Sloan, Lina, and Megan travel to Montreal to attend and present research at the Microbiome Keystone Conference on Chemical Mechanisms and Biological Consequences. And later in the month, Wei Li officially joins the lab! February 2019: The Devlin lab welcomes a new rotation student, Wei Li, a first-year graduate student in the Harvard Chemistry & Chemical Biology (CCB) PhD program, who will be with us this month. November 2018: Snehal received the American Heart Association (AHA) Postdoctoral Fellowship! And Sloan was quoted in a Harvard Medical School article titled, “Spurring Innovation,” about the HMS Dean’s Grant will fund our work in collaboration with Jun Huh’s lab. October 2018: Our lab and our eLife paper [link] received press coverage from the Harvard Magazine. September 2018: The Devlin lab welcomes a new rotation student, Bailey Schultz, a first-year graduate student in the Harvard Chemical Biology (CB) PhD program, who will be with us for the next few months. June 2018: The Devlin lab welcomes Megan McCurry, a graduate student in the Harvard Chemical Biology PhD program.